I know I've been neglecting this blog. I have been knitting and weaving, and although I'm not sewing, I am cleaning up the sewing room and hope to maybe squeeze something out in the next month. Changes are in the air and as a result I may only have a month to sew before the sewing machine is unavailable until next fall. Of course I've been sewing very little over the last few years so not sewing for 5-6 months will be nothing new. Placemats that I wove on my rigid heddle. They're off the loom, but I haven't cut them apart yet and finished them completely. 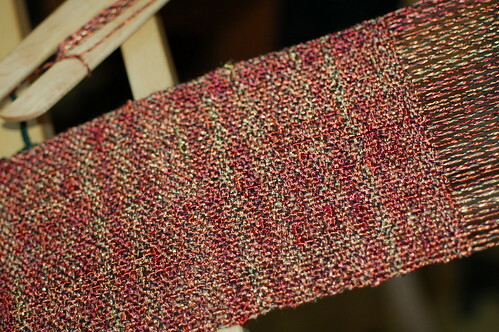 The weft yarn is Lily Sugar n' Cream and the warp is recycled cotton/acrylic/wool from a failed knitting project. 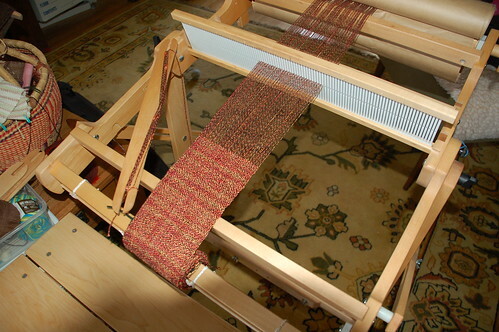 Here's a scarf that's just about finished on the rigid heddle. Or maybe it'll be a sash/belt. The weft and warp yarn is rayon from Valley Yarns Brilloso. This was a big lesson learned - this yarn has a black thread plyed with it that was not really strong enough to withstand being passed through the heddle. Sometimes the black thread would break and it caused a big mess. The other lesson learned was not to use slubby yarn as the warp. I didn't know this yarn was slubby - the first hundred yards or so was relatively smooth. After I warped about 6 inches, slubs started appearing every 12-15 inches. 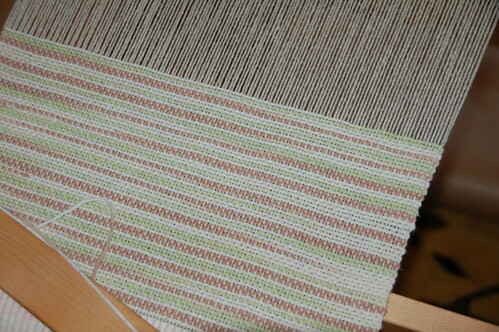 Like a newbie weaving idiot, I kept warping. I ended up unwarping all the slubby stuff and what you see is what I left for the warp width. And finally, here are my husband's Tiger Socks. The yarn is Opal Zweger Garn Rainforest. I used size 1 needles and cast on 76 stitches. 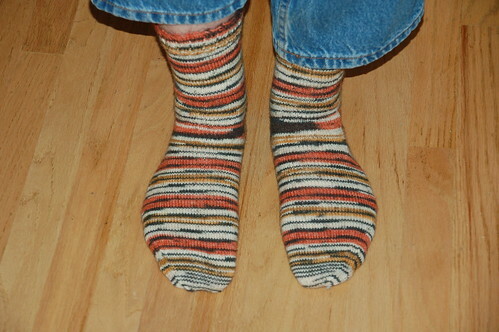 The ribbing is 2x2 and the body of the sock is stocknette, the heel is Eye of Partridge.